Yes that's it. Almost end of 2017, a year that I hardly posted. Now these last few weeks have been dark and dreary so again no new skyphoto's. Taken from my window, sky over Rotterdam. This week we had lots of snow and even more rain so there was hardly any sky to see. But I have lots of sky photo's from some time ago so I am using one of those again today. We haven'd had much winter till this weekend. It has been snowing in some parts of our country but not much to talk about really. Over here in the western part we just had some wet snow yesterday. .We did have a lot of rain and wind for weeks though. Of course we still can get a late winter but I'd rather think about spring. We Dutch like to talk about the weather, too much rain, or wind or cold or hot.There is always something we don't like. LOL. How is that in your country? As I haven't made many photo's lately I got back to my trustworthy computer. I found a collage in my maps from a few years ago that makes me feel happy. This year we went cruising again and visited St Petersburg, Russia, for the second time. I did post about the beautiful churches there more than once but I still have photo's from one visit last year I never showed before. The Sts Peter and Paul cathedral. Beautiful on the outside but stunning on the inside. I made photo;s but in person it is so much more beautiful. I have never seen so much gold and artwork in a church. See for yourself. The people on the photo's are all also visitors and tourists. December in this country is usually cold but this year it is entirely different. We have not had any snow or ice. During the day most of the times it is around or above 10 degrees Celsius. Very strange. Now, next week it is our 55th wedding anniversary and I remember 5 years ago we had the most ever snow falling in one night in this country. And that was the day we were having our anniversary party. What a day. I was looking through my photo's and memories came back. Thought I would show you some. I usually don't show much from my private life but for once it is alright. dh getting the car ready to get to the shops. 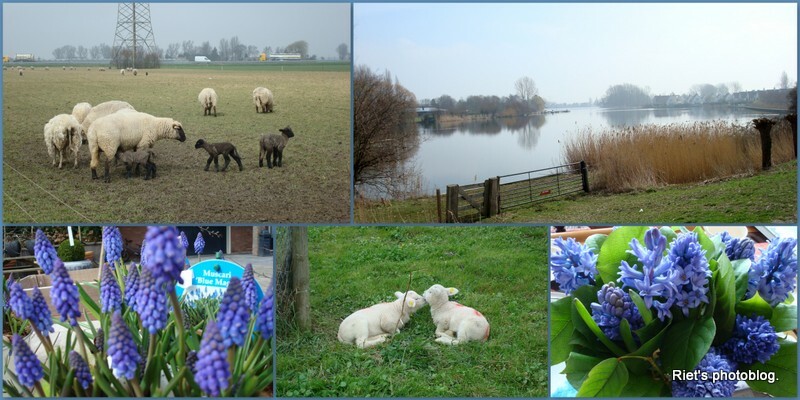 A couple of months ago we visited Noord Babant the beautiful province where I was born and lived when I was young. That southern part of our country where most people were Roman Catholic. Those beautiful little villages with their old farms that were transformed to beautiful houses. It was raining a bit as you can see. Lighting a candle for somebody we loved. Big statue in front of a restaurant. Built in 1614 as you can see. The church in Eindhoven I went to with my friends. And next three photo's I made in a lovely little tea-salon and garden.